This beautifully-detailed, swing-style locket features a cut-out, peek-a-boo design that holds two personalized photos—one on the front and the other on reverse. A petite, diamond accent front and center provides a luxe, finishing touch. 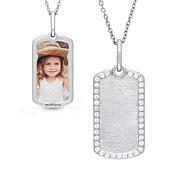 Perfect for everyday wear, this special piece is destined to become a treasured family keepsake.